The last live performance of NBC’s “The Voice” last night ended with the first winner of the American import from Holland. Javier Colon stood as part of the final four against Vicci Martinez (Team Cee Lo Green), Dia Frampton (Team Blake Shelton), and Beverly McClellan (Team Christina Aguilera). Then, as part of the final two, just he and Dia Frampton not expecting that his name would be the one to be announced as the winner. “I just never hold high expectations because of my past experiences” said Colon. In an interview earlier today, Colon stated that his future plans does not include him moving away from his home in Connecticut which is where his support group is. Colon also talked about his past under Capitol Records and the irony with him stepping out to “The Voice” wrap party just across the street from the iconic building. The record he created under the label tried to promote him as an R&B singer. Colon stated that he feels he is more pop/songwriter. Basically, he said Capitol Records tried to make him into something he isn’t. 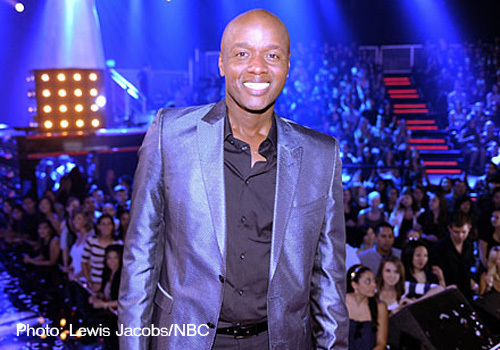 A mistake he says he won’t make again this time around in this second chance from winning “The Voice”. He has won a recording contract with Universal Republic Records, $100,000 and a lead singing feature on “The Voice” tour. Colon’s first album is expected to come-out in September of this year. He says it will be a mixture of pop/singer/songwriter genre. It all started with the turning around of “The Voice” coaches chairs. In fact, ALL of them! Colon said that who he decided to pick as his mentor, which was Adam Levine, was a competition decision. “I would have been happy to get on any one of their teams”. But, the most important factor was going with the person that was the most excited about him. “Adam was animated while I was singing – trying to get Blake to turn around. That spoke volumes to me”. While singing with legendary singer, Stevie Nicks on last night’s show, Colon stated that she had a strong presence and he took-over as more of a “back-up” singer during their performance of the Fleetwood Mac song “Landslide”. As for getting him prepared for his new found fame, Colon stated that Levine told him to “hold-on for the ride”.